With every May comes Mother’s Day – the perfect time to recognize just how much moms do for their kids. 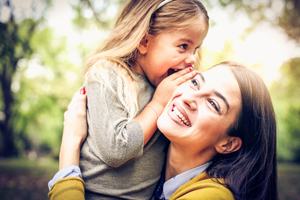 Our gift to mothers this year is a list of six time-saving oral health hacks that can make things a little bit easier for moms on the go. Keep oral health supplies in your car. Stock up with travel-size toothbrushes and toothpaste, floss, healthy snacks and water bottles. Choose mouth-healthy foods that don’t spoil easily like sunflower seeds, pumpkin seeds, beef jerky and almonds. It’s also good to keep a set of oral health supplies in your desk at work in case you need to freshen your breath before a meeting or to get that piece of lettuce out of your teeth after lunch. Find out if you’re brushing correctly. The next time you have a dental appointment, ask your dentist or hygienist what parts of your mouth could use more attention during your oral health care routine. Or stop by the store to pick up plaque disclosing tablets. By chewing on a disclosing tablet, plaque that you missed will turn a bright color, so you know where to pay extra attention when you brush. Eat “detergent foods” after meals or as midday snacks. No, these have nothing to do with laundry. Detergent foods are crunchy, fiber-rich foods that can partially remove plaque while you chew. They also increase saliva flow to wash away leftover food particles. Some great options to choose are raw carrots, celery, broccoli, cauliflower and apples. The best hack of all: Avoiding costly and time-consuming dental procedures by practicing good oral health habits daily. Make sure to brush twice a day with fluoride toothpaste, floss once a day and visit the dentist regularly.